See what was left by crafty Mattel today! Angella? Gwildor? Dragstor? Let the speculation begin! Last edited by Jun-Yor; October 14, 2013 at 12:50pm. Could be Spinnerella as well. Like vintage Netossa she was promoted with a sword but in the end didn´t came with one and her accessories are magenta like this sword. It could be for Angella. Spinnerella's sword is the same Bubble Power She-Ra sword. This looks closer to the one Angella is holding in the pic. The hilt looks maroon to me though, not pink. I have no other ideas on who it could belong to. Double Trouble? Is that to wide fetched????? I really hope its for Angella. Bring on more POP!!! I would like it to be Angella. Aside from Razz, she's the last truly important POP character left in my opinion. It'd be nice to get both Glimmer and her mother together in the same year as well. After reading the thread title and before even seeing the photo, Angella was my immediate guess. She definitely needs a weapon as the vintage never came with anything. Hopefully for Angella. Always enjoy the secret accessory guessing game. Welp, I have no guesses! Best one sounds like what ya'll are sayin'. 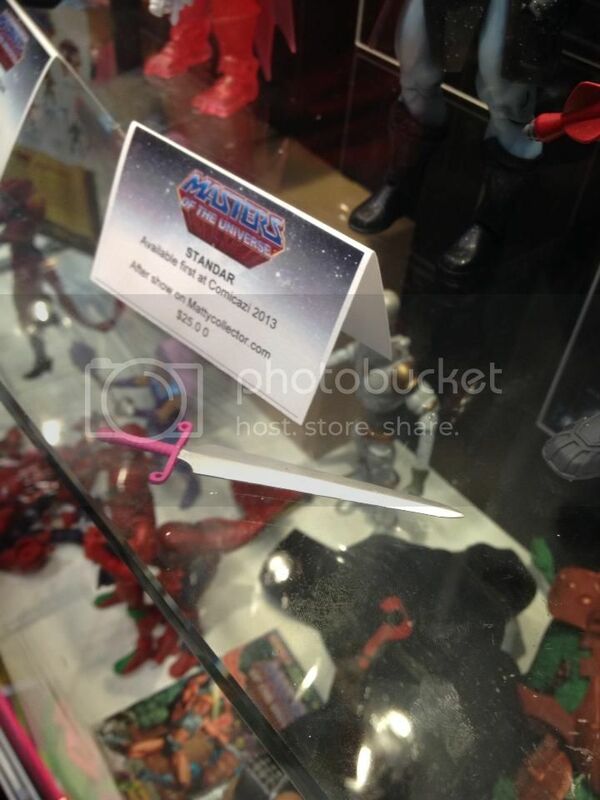 If it IS Angella then I really hope they work out the wings in some way like that Hawkman figure or something. I'm assuming we won't see another Sorceress style in terms of the wings, since they were trying to recreate her opening-arm thing. Angella didn't have any sort of action feature like that, right? ....or maybe the sword is meant for NA Teela? I'm betting on Queen Angella, she is one of my most wanted POP figures. Although we know she'll have an awful crotch which will ruin the look of the figure. IT'S TIME FOR MOTUC TO GO GREEN … INCLUDE THE TWIGGETS IN 2019!!! My guess is Rio Blast. Icer and Filmation Clawful made. Mission complete. Probably Angella. Mattel can put that Glimmer buck to good use. Angella. The leap of logic to Spinerella is too much, this is definitely for Angella. Besides, she'll share enough tooling with Glimmer that it all but ensures her for 2014. My first guess was Angella, but I assumed Matty would wait a little longer after Glimmer to put her in the line. 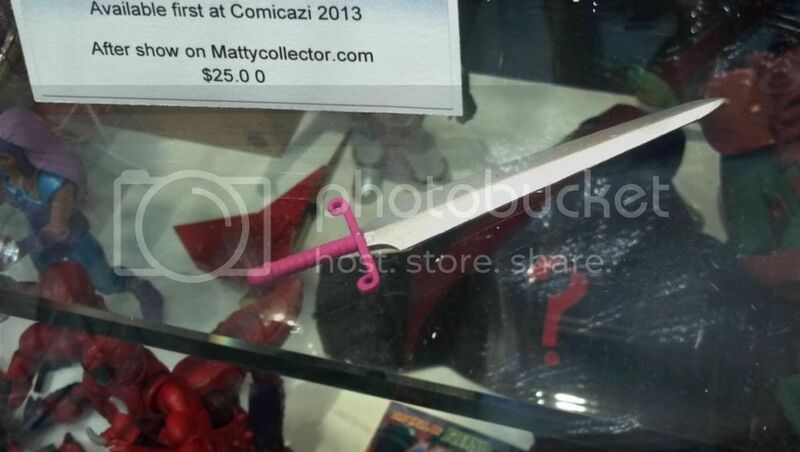 Pink Teela has been suggested on FB for this sword. While I want Filmation Teela more I'd except Pink Teela, she at least has the right hair color, red. Last edited by Slave2Evil_Lyn; October 13, 2013 at 01:33pm. The Angella guess sounds pretty accurate and I would be ecstatic if it is so! All times are GMT -4. The time now is 05:03pm.